Abby Wize AWA - What Is It? Home > Books > Catalog > Abby Wise - What Is It? Abby Wize loves horses, real and dreamt. 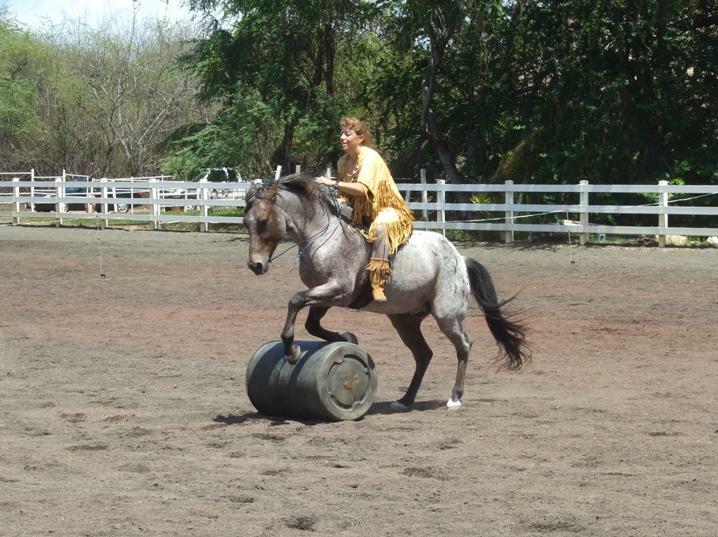 Riding is her only escape from an overbearing mother. She doesn't realize she's been learning unsafe horse-handling until a runaway horse catapults her into a tree...and into a future of special people and animals she never could've imagined. It quickly feels more like home than the world she came from, and she begins trading her insecurity and discontent for confidence and faith. From the very beginning, I could feel a strangely satisfying closeness with Abby Wize and her love of horses and of reading. If I were still an adolescent reading this book, Abby would be my new BFF. Very interesting reading for the horse-oriented. I was enthralled! I especially liked the dragon-riding. This novel ingeniously shows that lessons learned about horses transfer well to life. Also, the author successfully blends faith and natural horsemanship. Kudos to Ms. Bradley for introducing Abby. I'm eager to read more of her adopted world of exceptional people and unconditional love. I wrote this novel for you and your friends. I hope you are carried 'AWĀ' to new places when you read it! Advanced pre-teens, teenagers, and adults who like horses, spiritual discoveries, and awesome adventure should love this book. Lisa Bradley earned her degree in journalism and art, and was a newspaper reporter and portrait photographer until her marriage in 1985. Three sons preempted most professional plans and a lifelong passion for horses. 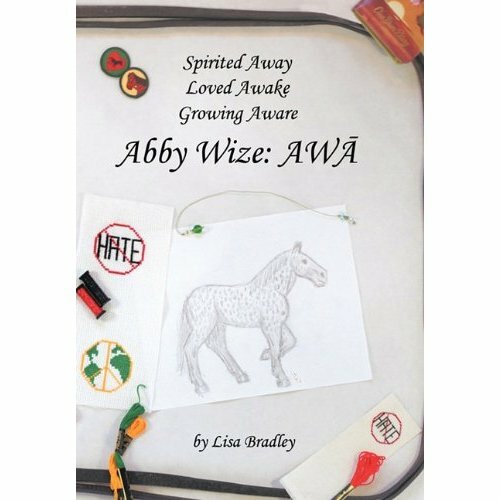 In 2007, after six years of learning horse whispering, eight years of gathering ideas, and 31 years of Baha'i perspective, she started writing Abby Wize: AWĀ. Abby Wize: AWĀ, 293 pages., is $29.99 hardcover, $19.99 softcover, $9.99 Kindle. It includes counted cross-stitch charts to make the “No Hate” and “World Peace” patches shown on the cover. You can order Abby Wize: AWĀ today on Amazon. Bradley is clearly a true believer and wants to share both her religious beliefs and love of horses. She has a talent for communicating both. I prefer romances, but it’s a good story line that has kept me reading. Lisa, I read your book...it's awesome!! I got back [home] and started reading your book. Finished it this morning (sometime after midnight!!) I love it. From where may I buy a few copies to share with friends and donate to the library? It's an engaging story, with good information in the text plus excellent references in the back. I like the personal touch, of sharing how you wove your own experiences into it. It's an inspiring story, leaving the reader with a sense of hope and enthusiasm for participating in the process of working towards the Most Great Peace. The way you pieced [my] drawing together bit by bit was very creative!! Thanks so much for allowing me to be a part of your book. Lisa, would you believe my grandMya not only insisted on buying her own hardcover copy (with birthday money), she's reading it at age 8, loving it, and telling me the story as she goes along. I'm so glad she's into a book where the exciting conflict is not all about physical and emotional violence. It means a lot to me that, as the story progresses, the most important conflict turns out to be the resounding dissonance Abby experiences between her present world and the future she's being shown. The biggest battle -- the struggle between fear and faith -- is fought in her own mind and heart, and she's the winner. That's a huge part of what made being your editor not just a gig, but also a labor of love. This book is a joy, a coming of age story of a girl named Abby who is making the transition from living in her family to living in the world – in the most magnificent way. With tributes to pastimes as diverse as horseback riding and counted cross-stich, the story begins in a familiar mode, encompassing a loving, observant catalogue of many of the pitfalls of girlhood, replete in this case with the constricting, omnipresent hazard of abuse from above, from one's own mother. There is for example the acutely palpable account of Abby's attempt at eating jello because her mother is forcing her to. There is a wry (and not overdone) familiarity with idiom current among today's youth sprinkled through this narrative. There is a coherence in the characters; scenes are brought richly and satisfyingly to life. We feel for this girl in her family's embrace. And then, fantastically, the book changes tack, about a quarter of the way through. From a coming of age tale of a girl, it becomes a coming of age parable for humanity, offering us a glimpse into a future world of wonder -- all the more tantalizing because plausible -- based on principles and ideas of living we ourselves are only just beginning to grow into the possibility of as a world in our time. Finally we realize this is not just a book for girls entering adolescence! In sly fashion it is a keenly worked-out vision for us all, based on the teachings of the Bahá’í Faith. A mature writing style goes a long way to carrying this book where it wants to go. One reason it works well is the great attention to small, smart, true-to-experience, well-earned details throughout. When Abby recalls the name for a particular style of architecture her mother had told her about she "could almost hear her mother's voice" – and with this one small telling detail we get inside the character's experience of it directly. Relation to mother is one of the touchstones in this book, grounding it by keeping the reader tied to recognizable personal feeling – an achievement for a fantasy-style novel, that keeps adults engaged in the writing too as a piece of literature. And when there is excitement, as with Abby's passion for horses, it is also palpable: "Abby couldn’t help it; the horses reeled her in. The sight of them, their smell, their movement always riveted her; but now – with her new eyes, ears, and spirit – they were the magnet to her iron particles. She peered between the diamonds of the smooth tan fence, her fingers laced through its links, her eyes drinking in every detail she could latch onto." Finally this is not a fantasy novel but a novel that reveals our underlying noble reality, that which is our birthright and which we come to believe reading these pages that we will be able to grow into together, by shedding obstacles and solving the problems of our current times, with guidance. It is laid out with a beautiful and uplifting vision that includes great technical as well as societal advances and shows the future as a kind of golden age. Thus it is important that the writing is up to the task literarily of carrying this vision. And it is. The long section of notes at the end is further testimony to an admirable vigilance in helping readers make sense of this wonderful future in relation to present reality. This lovely novel will enrich and inspire young minds for years to come. It shows us that we can grow together truly as a world, and transcend some limitations that pervade our current cultures. As Abby muses at one point when she is in this future world: "This was so opposite the invisible, third-class-citizen status she was used to that she felt something both break and bloom inside her." Bonega!